Paul J. Gruenewald is a Senior Research Scientist and Scientific Director of Prevention Research Center (PRC) in Berkeley, California, a division of the US-based Pacific Institute for Research and Evaluation (PIRE). Research at PIRE is funded by games and contracts from the National Institutes of Health, National Institutes of Justice, Office of Juvenile Justice and Delinquency Prevention, the Center for Substance Abuse Prevention, and other national, state, local and private funding agencies. Dr. Gruenewald is Principal Investigator of a Center grant funded by the National Institute on Alcohol Abuse and Alcoholism to study “Environmental Approaches to Prevention”, and a Merit award recipient for his studies of “Alcohol Outlets and Violence. Wendy Loxley is an Associate Professor at the National Drug Research Institute, at Curtin University of Technology in Perth, Western Australia, where she ahs been employed for fifteen years. Much of her early research career was concerned with addressing the risk of blood-borne viruses to Australian injecting drug users, and she has been involved in a number of large quantitative studies exploring this issue. Other research experiences include monitoring illicit drug use among police detainees, the evaluation of community-based approaches to drug law enforcement, and the use of testing and vaccination to prevent hepatitis C and other blood-borne viruses among injectors. Tim Stockwell is currently Director of the Centre for Addictions Research of BC, Canada, and, until mid-2004, was Director of Australia’s National Drug Research Institute based at Curtin University in Western Australia. He recently co-edited the critically acclaimed Wiley book International Handbook of Alcohol Dependence and Problems with Nick Heather and Tim Peter. He has published widely in the field of addiction studies and has particular expertise in the areas of alcohol and other drug epidemiology and prevention policy. John Winston Toumbourou is Associated Professor at the Department of Paediatrics, University of Melbourne, and a Senior Researchers at the Center for Adolescent Health, within the Murdoch Children’s Research Institute. John is a founding member and the past Chair of the College of Health Psychologists within the Australian Psychological Society. He is a Principal Investigator on a number of studies investigating healthy youth development, including the Australian Temperament Project, and the International Youth Development study. 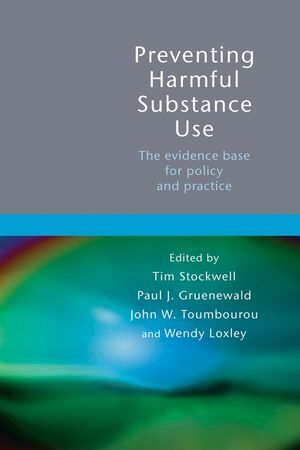 1.1 Preventing Risky Drug Use and Related Harms: The Need For a Synthesis of New Knowledge (Tim Stockwell, Paul Gruenewald, John Toumbourou and Wendy Loxley). SECTION 2: Patterns of risk and related harms (Editor: Tim Stockwell). 2.1 Introduction and Overview (Tim Stockwell). 2.2 The Global Burden of Disease Attributable to Alcohol, Tobacco and Illicit Drugs (Juergen Rehm, Switzerland and Robin Room). 2.3 Substance Use and Mental Health in Longitudinal Perspective Marree Teesson, Louisa Degenhardt, Wayne Hall, Michael Lynskey, John Toumbourou and George Patton). 2.4 Predicting Developmentally Harmful Substance Use (John Toumbourou and Richard F. Catalano). 2.5 Population Ecologies of Drug Use, Drinking and Related Problems (Elizabeth LaScala, Bridget Freisthler and Paul Gruenewald). SECTION 3: Interventions for children and adolescents (Editor: John Toumbourou). 3.2 What Do We Know About Preventing Drug-Related Harm Through Social Developmental Intervention with Children and Young People (John Toumbourou, Jo Williams, Elizabeth Waters and George Patton). 3.3 The Evidence Base For School Drug Education Interventions 9Nyanda McBride). 3.4 Alcohol Policy and Youth Drinking: Overview of Effective Interventions For Young People (Joel Grube and Peter Nygaard). 3.5 Testing a Community Prevention Focused Model of Coalition Functioning and Sustainability: A Comprehensive Study of Communities That Care in Pennsylvania (Mark Greenberg, Mark Feinberg, Brendan Gomez and Wayne Osgood). SECTION 4: Interventions in the community; illustrative case studies (Editor: Paul Gruenewald). 4.2 Community Systems and Ecologies of Drug and Alcohol Problems (Harold Holder, Andrew Treno and David Levy). 4.3 Violence Prevention in Licensed Premises (Ben Haines, Australia and Kate Graham). 4.4 Application of Evidence-Based Approaches to Community Interventions Andrew Treno, Juliet Lee, Bridget Freisthler, Lillian Remer and Paul Gruenewald). 4.5 Preventing Alcohol and Other Drugs in the Workplace (Richard Midford, Fredrik Welande and Steve Allsop). 4.6 Effects of a Community Action Program on Problems Related to Alcohol Consumption at Licensed Premises (Eva Wallin And Sven Andreasson). 4.7 Strategies For Community-Based Drug Law Enforcement: From Prohibition To Harm Reduction (Chris Canty, Adam Sutton And Steve James). SECTION 5: Legislative and Regulatory Perspectives on the Prevention of Risky Drug Use and Harm (Editor: Wendy Loxley). 5.2 Regulating Tobacco to Minimise Harms (Jonathan Liberman and Ron Borland). 5.3 Intelligence-Led Regulation of Licensed Premises (Neil Donnelly and Suzanne Briscoe). 5.4 Deterrence Theory and the Limitations of Criminal Penalties for Cannabis Use (Simon Lenton). 5.5 Interventions For Illicit Drug Users within the Criminal Justice System: A Review of Some Programs in Australia, the United Kingdom and the United States (Wendy Loxley). 5.6 Social Ecology and the Invention of New Regulatory Strategies For Preventing Drug and Alcohol Problems (Bridget Freisthler and Paul J. Gruenewald). SECTION 6: The evidence base for prevention in broad perspective (Editor: Paul Gruenewald). 6.2 What is "Evidence," and Can We Provide It? (Bob Saltz). 6.3 US Policy on Illegal Drugs: What We Don't Know Keeps Hurting Us—A Perspective On Future Research Needs (James C. Anthony). 6.4 Preventing Tobacco Use and Harm: What Is Evidence-Based Policy? (Sandra Younie, Michelle Scollo, David Hill and Ron Borland). 6.5 Moving Toward a Common Evidence Base For Alcohol and Other Drug Prevention Policy (Harold Holder and Andrew Treno). 6.6 The Evidence Base For Preventing the Spread of Blood-Borne Diseases Within and From Populations of Injecting Drug Users (Marcia Russell and Susan Carruthers). 6.7 The Evidence Base For Responding to Substance Misuse in Indigenous Minority Populations (Dennis Gray and Sherry Saggers). SECTION 7: The future of prevention research and policy(Editor: Tim Stockwell). 7.2 Investing For Cost-Effectiveness in the Face of Uncertainty: Applying Financial Portfolio Optimization to Prevention Programming (Jonathan Caulkins). 7.3 How Should Governments Spend the Drug Prevention Dollar: A Buyer's Guide (Ted Miller, USA and Delia Hendrie). 7.4 Key Moments in the Ethnography Of Drug-Related Harm: Reality Checks for Policy Makers? (David Moore). 7.5 Recommendations For New Directions in the Prevention of Risky Substance Use and Related Harms (Tim Stockwell, Paul Gruenewald, John Toumbourou and Wendy Loxley).